Ever since I was in Junior High I was writing acceptance speeches for my Tony Award. It turned out later that I wouldn’t need those speeches since I was a bad actress, but I didn’t know that yet. So I dreamed. The first time I remember watching the Tonys, or as they were called then, The American Theater Wing Antoinette Perry Award for Excellence in Theatre, Fiddler on The Roof won. It could have been that my parents turned it on because a Jewish show was up for an award. But, I didn’t care. I loved seeing the show. It was a short award presentation, but I was hooked. In my first year of college The Tony Awards became a full special with performances from each musical. On the 20th Century won musical of the year, with the amazing Madeline Kahn. I was hesitant to see the revival this year, but I enjoyed it thoroughly I was happy Fun House won this year even though I was awed by An American in Paris. Mostly though I’m happy for the winners no matter what my opinion. It’s their chance to read their rehearsed speeches, surprised and pleased to have won the votes by the members. The magic of theater is a pleasure I thoroughly enjoy. It can be a simple show, or it can be a grand production. I’m willing to go with whatever reality is created when the lights go down and I’m transported into another world. My first Broadway show was the original production of Grease in 1972. I had seen visiting shows in Philadelphia, but being on the Great White Way was the best for this preteen. The most recent Broadway show I saw was Airline Highway, a wonderful ensemble piece that closed too early. 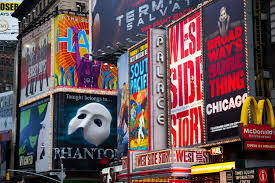 And, I will continue to attend Off-Broadway and Broadway shows because it makes me happy. I don’t need an acceptance speech to be in the audience, I just clap loudly to communicate my great appreciation of the talent I just witnessed.